Our special riding weekend package is a must for all equestrians. 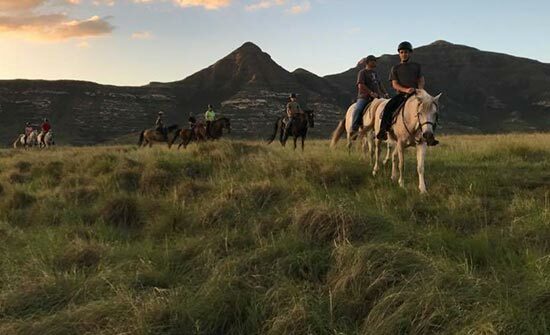 Moolmanshoek Private Game Reserve has over 14 different species of game that can be viewed whilst riding through the reserve. 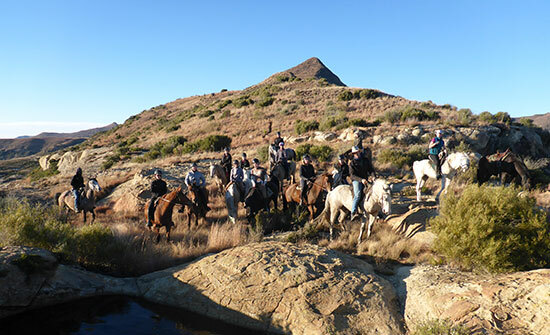 The ride includes dinner bed and breakfast in the Moolmanshoek Lodge, 5 hours of riding and a picnic lunch on Saturday. Minimum of 4 riders required. Our ride most suitable for beginners. Small children can join on a lead rein. Ride in the Reserve amongst the game. Our guide will customise the ride according to the group experience and ability. Ride duration normally between 1 and 2 hours. 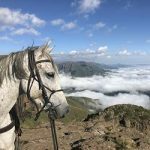 More experienced riders can venture further out to the mountains and include more cantering along the plains. Take a ride on horseback to view the Bushmen paintings estimated to be over 400 years old. Alternate between plains and mountainous areas and expect to spend between two and three hours in the saddle. 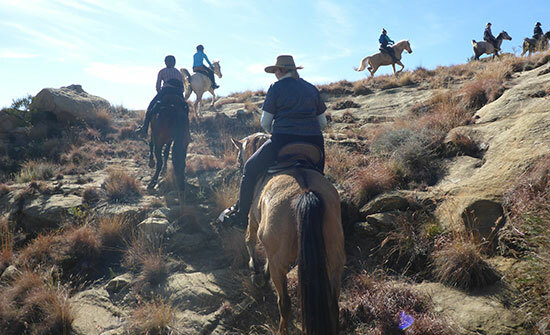 Expect long canters where possible and some mountain area in between to catch your breath and enjoy our amazing Eastern Free State scenery. Ride to Rosendal and back on a scenic 50km route. Start off with a climb covering mountains and descend to the plains. Canter along the dirt roads and have a delicious brunch in Rosendal before returning to Moolmanshoek. Every advanced riders’ dream. Join our best guides on a challenging ride through the Reserve, pushing your limits and completely taking you out of your comfort zone. 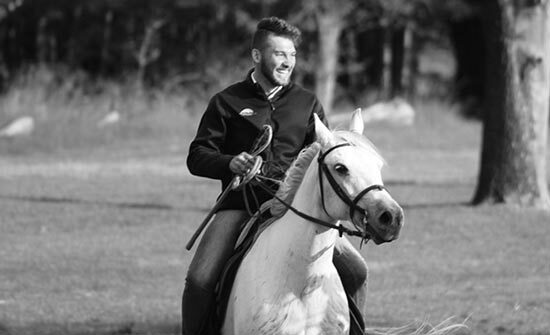 Spend a minimum of two hours in the saddle on an exhilarating ride on our sure-footed steeds. 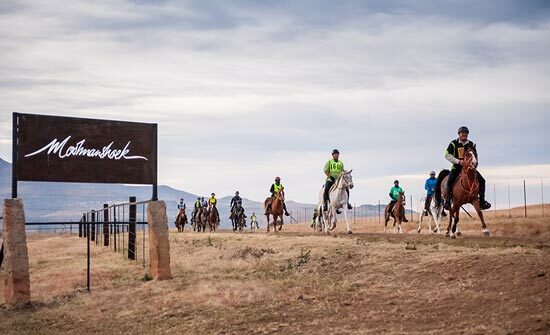 Moolmanshoek hosts 2 endurance rides affiliated with Free State Endurance each year. Distances vary between 40 and 80 km. 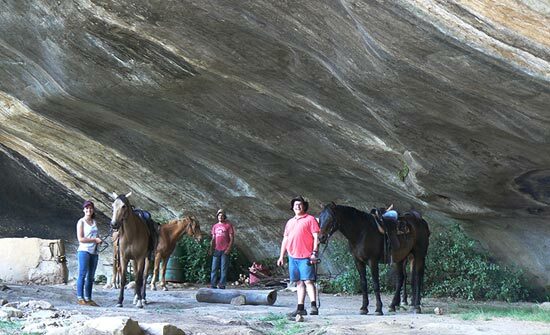 One of the most scenic rides in the Free State it serves as excellent training for your experienced horse and the perfect build up session for your novice horse. Contact us for more information.